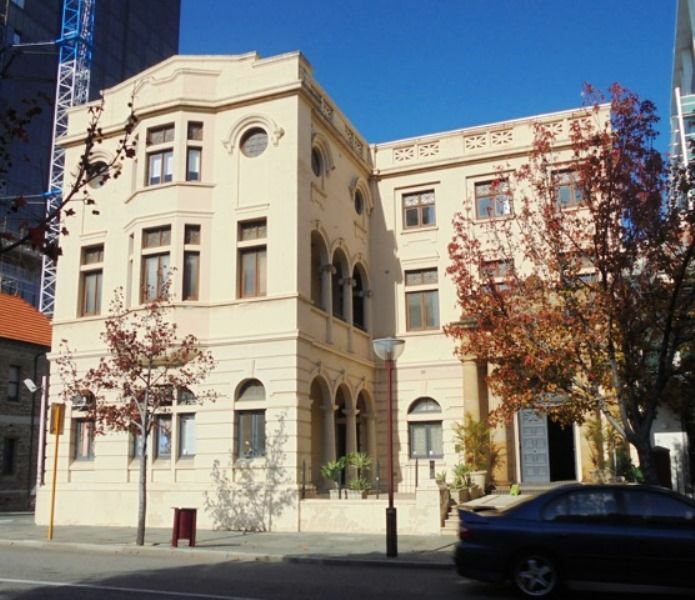 The Young Australia League Memorial Building commemorates those members of the Young Australia League who died in service or were killed in action in World War One. The construction of the building was commenced with a ceremonial laying of the foundation stone by Prime Minister William M. ['Billy'] Hughes on April 23, 1922. 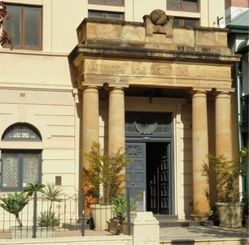 The official opening of the building, on November 23, 1924, was performed by the Governor, Sir William Robert Campion. The Young Australia League some time ago purchased a block of land at the corner of Murray and Irwin streets with an adjoining building for a sum of £4000. A memorial building is to be erected on the site at an estimated cost of £25,000 and during the present year about £10,000 will be expended in the work. 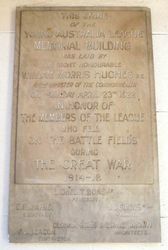 The memorial is to be in honor of the 80 members of the league who died in the war. Yesterday the foundation stone was laid by the Prime Minister, Mr. W. M. Hughes, in the presence of a big assemblage. The Daily News (Perth) 24th April 1922. The Young Australia League (YAL) was a patriotic, independent, nonpolitical, non-sectarian youth organisation founded in Western Australia by John Joseph ['Boss'] Simons [1882-1948] in 1905. Originally a branch of the West Australian Football Association, of which the charismatic Simons was the secretary from 1905-1914, the League organised intra and interstate tours of young Western Australian football players to promote the code of 'Australian Rules' football as part of a broader nationalist agenda. By 1910, the sporting component of the League was subordinate to Simons' wider purpose of inculcating in Westralian youth a vigorous sentiment of Australian nationalism within the framework of Empire. Lionel T. Boas J.P. President. Oldham, Boas & Ednie Brown Architects.